Louis Eguaras, a renowned chef at the Le Cordon Bleu Program at the California School of Culinary Arts, provides readers with a terrific overview of what is truly involved in the preparation, cooking, and presentation of meals. He also provides invaluable insights into just what is involved in making this one’s chosen profession. The book will feature a wide range of illustrated lessons, from how to properly hold a knife… to the history of food… from food preparation and presentation… to restaurant hospitality and management, and much more. 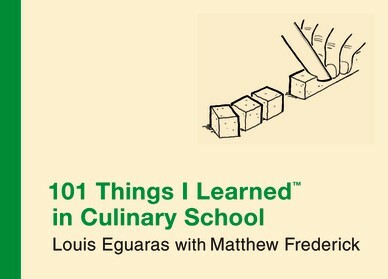 The book will be presented in the distinctive and highly-attractive packaged style of 101 THINGS I LEARNED IN ARCHITECTURE SCHOOL, and will be the perfect gift for anyone who is thinking about entering culinary school, is already enrolled, or even just the casual chef. I am not a chef – I don’t even play one on tv! But I do have a secret – I am a fanatic about food programs on television – I love watching chefs create and design. Even with my love of watching food created, I don’t cook much at home but I always think that I’d love to learn more about cooking. For that reason I was really interested in reading 101 Things I Learned in Culinary School. I wasn’t sure what to expect when I received my copy of the book but I quickly discovered that I LOVED the format of the book! Each of the 101 “things” are numbered and each one has a catchy title. Each “thing” is also presented on the right hand page with a drawing that helps to explain the concept on the left hand page. For example, “thing” number 2 is entitled “Five knives do 95 percent of the work”. It explains the difference between stamped and forged knives as well as different types of steel. On the opposite page is an illustration that shows the five different types of knives as well as an explanation of which works best for which culinary task. I also liked that this book does not just examine elements of cooking. It also provides information on other restaurant-related topics, such as: aspects of customer service; key elements of various meats and fish (including #26 “Fresh fish smells like the water it came from. Old fish smells like fish.”); various types of sauces; the cooking process itself and much more! Overall, I liked that this book is easy to understand and follow because it is written in such a way that both professionals and lay people can understand what is being explained! I have been reading this book a few “things” at a time and I feel like I have learned a great deal! It makes me want to go and create something right now! I would recommend it to anyone who is interested in learning about cooking! I love cooking, but I feel like I’m stuck in a rut and I’d love to learn some new skills. I would love to win this for my dear husband—he dreams of culinary school. All of this information in one place for us to discover. Would love this in my kitchen. i really love to cook and would love to read this! I am an experienced home cook and would love to read any tips the authors have to give. I know I’d really like to read this, I’m always looking for new cooking information. Thanks for the giveaway.